Over the past week, you have generated record hits and comments regarding the approval of a new land site for Metea Valley High School here at the World of Naperville. While you had a wide range of opinions to share, one comment in particular impressed me so much that I had to feature it as a full-fledged posting. “As most of you know, some Neuqua Valley parents are concerned that if their children go to Waubonsie Valley that their children will not receive as high of an education, that their children will be going to school with lower class children who are “bad influences”, or that their home values will be going down, (although the housing market is terrible right now anyway). But does anyone ever bother asking the students what they think? I know the classic comment made is; “They’re just teenagers, what do they know?” And as I speak on behalf of a lot of students, I believe that we know more than you think we do about the situation. I have resided in Naperville school district 204 for 10 years now, so I am used to the ‘extravagent’, and ‘out-of-the-ordinary’ lifestyle that living in ‘Naperworld’ provides. It’s the truth, isn’t it? Naperville, IL, is not like other towns in this country. The education we receive here, and the opprotunity we receive is beyond what some of our parents could have ever dreamed of when they were growing up. We are told everyday by our educators at school that both high schools are better then your average…so why is there still so much, I guess to say “drama”. Come one, this is not middle school here! “Oh man! Now I have to sell my Neuqua spirit wear!” The same probably goes for Waubonsie students, who may attend Metea. So as you can see, the students of District 204 are not ultimately concerned with where they are attending high school. Frankly, most of us are too involved and busy with our current lives to care. I mean, there are exceptions, as in the past there were some unreasonble boundary propositions when it came to transportation time, but in the end, the chosen boundaries in my opinion were the best out of the proposed. Let’s just hope that eveyone can be happy this time around and that all of the drama that boundary prepositions have caused in the past can be avoided. In a way, I can’t help but see a little of myself in this individual. When I was in high school I had the fortuante opportunity and latitude to write a weekly youth opinion column in my local newspaper to provide the generational perspective. Kids these days have a far more powerful medium to express their thoughts and it is good to see they are willing to step forth and speak their own minds. As we approach the five year itch in our first Naperville home, my wife and I decided to head out the other evening to take a look at some of the offerings presently available in the local housing market. We do love our present location but we need just a little bit more space as my wife continues to build her business and the the boys continue their rapid growth and expansion. The one thing I can say about how the national housing downturn feels in Naperville is a bit sad. We looked at six houses in our price range on Monday evening and it’s as if you can feel the stress energy lingering within the houses. We’ve now read our share of MLS descriptions and the comment sections seem to indicate the desire for “quick exits”. Prices in many areas of Naperville are creating a buyer’s market as the big spring inventory approaches. Fortunately, it appears our subdivision has been selling fairly strong and while we weren’t expecting to make the move to a new home this year, the present conditions seem somewhat ideal to at least take a look. Nonetheless, the present economic crisis is teaching us all that we must live comfortably within our means and try to avoid overextending our financial position on our homes. I recall distinctly when we were going through the mortgage process on our first home and how our broker seemed perplexed as to why we weren’t interested in borrowing the maximum amount for which we qualified. The reality is I know there will always be someone out there who has a bigger and more elaborate house than we do and the question we have asked ourselves is what will be most comfortable for us, our finances and our lifestyle. At the end of the day, the size of the house does not determine the depth of you or your family’s character and we are happiest in life when we are living by our own expectations and within our own means. In end, life in America is a pursuit of self-defined happiness, not a futile pursuit of those elusive yet ever-present Jones’s. By the way, we want to thank Katie Navratil of Ryan Hill Realty for all of her help as we “test the waters”. She’s very knowledgeable and is really working hard for us on both ends. We’ve known Katie for a couple of years now and I would highly recommend her to anyone who is either looking to buy or sell in this present market. You can reach Katie at knavratil@ryanhillrealty.com . 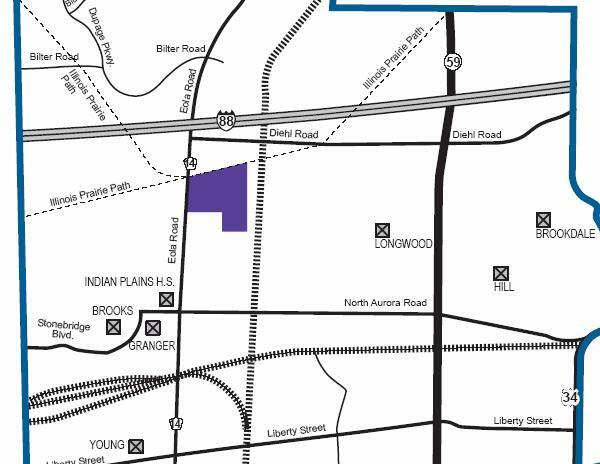 The good news is Indian Prairie District 204 has announced the selection of a new land site upon which Metea Valley High School will be built by the end of 2009. The bad news is if the Naperville Sun’s Potluck blog is any indiciation, upcoming discussion regarding new boundaries will be brutal. For those who haven’t seen the news, the new high school will be built on an 87 acre piece of land South of I-88 just east of Eola Road between Diehl Rd. and North Aurora Road on the Far Northwest side of Naperville. The price tag is $16.5 million which is roughly half of what the district was facing with the now infamous Brach-Brodie property. While I’m relieved our community will move beyond the land issue, we now turn to the difficult task of new boundary lines which will likely shift further north than the previous boundaries for the Brach-Brodie property. I am in hopes that we, as a community, can quickly move beyond the boundary battle and that those who live in particular subdivisions support the decision and that those who don’t live in those particular subdivisions stop taunting those who do. The reality is, we need to focus our energies on the equitable quality of all three high schools. Now is the time to address the host of concerns and perspectives which have been revealed about what some sadly consider to be the lesser of the three high schools and raise the school up now that it will have a bit more room to work with. This whole process has brought out the worst in social class warfare here in Naperville and I hope everyone pauses, takes a close look at the angry dialogue and realizes how sadly pathetic it all sounds. The reality is, District 204 has prevailed in making a decision which will be best for the entire district and not one that raises any questions about influence and motive. At the end of the day, we can all count our multitude of surplus blessings that we are fortunate enough to live in an amazing community which has two incredible public school systems. I will be the first of confess I was somewhat of a community theatre groupie when I was a kid. During the summers, the Youth Theatre of Hardin County staged a different musical production with a cast ranging from kids to high school seniors. Looking back, a big regret of mine is the fact I consistently chose little league baseball over participating in Youth Theatre. As a matter of fact, my acting debut in elementary school became my final stage call at the tender age of eight in which I was selected to portray the role of Frederick in our school production of Hansel and Gretel. After spending what seemed like days, our maybe it was hours, perfecting my single line I took to the stage for opening night, which ironically was also closing night. I stood proud and poised in the bright stage lights with my designer german costume, a Jane Meyer original (my mom), and heartily boasted in the heaviest thesbian tone which could be conjured up by a third grader “Sausages? Mmmm, I can almost taste them now“. Once the stagehands cleared the shower of roses from the stage to preserve the safety of the other actors and the seemingly endless standing ovations subsided, I relinquished the stage to the principal actors and the production was able to proceed. Despite this pint-size artistic misdirection of my youth, my sister was a devoted cast member for five summers which meant I attended nearly every show and matinee as they acted and sang their way through the summer season. One of the perks was also tagging along as the little brother to the cast after-parties which typically consisted of a late night second dinner consisting of the epic “J-boy” burger at Jerry’s Restaurant. At the end of the summer season, I also enjoyed the big wrap party with a DJ playing new releases from bands ranging from The Human League to Men at Work. In my sister’s final season I finally committed to working on the backstage crew for their production of Guys and Dolls but that is about as close as I came to the actor’s stage. Nonetheless, given my deep love for the arts as well as my own music/film pursuits, I do enjoy live stage productions whenever the opportunity arises. Friday night was one such opportunity as not only did we finally attend opening night of the Magical Starlight Theatre’s production of Bye Bye Birdie, but we also decided to take along our six year-old for his first big musical stage production. It was only fitting that we would see Bye Bye Birdie as the summer the Youth Theatre of Hardin County performed Bye Bye Birdie back in 1980-something, both my brother and sister were part of the cast. With much shame it is important that I fully disclose the embarassing fact that this was our first Magical Starlight Theatre production after procrastinating and talking about becoming regular patrons for years. We arrived late at just around the time the show was to begin. We took our seats in the Naperville Central Auditorium which was about three-fourths full. My six year-old was buzzing with anticipation. The lights went down, a screen illuminated on stage with some b-roll Conrad Birdie footage as well as other members of the cast. Suddenly, a cascading wave of screeching screaming girls came running down both sides of the aisle as if Sanjaya himself had taken the stage. We then heard our first chorus of the repetitively familiar anthem…”We love you Conrad, oh yes we do…. we love you Conrad and we’ll be true….”. From there, the production came to life and I must say that we truly enjoyed the wide age-range of the cast not to speak of the many bright spots of local talent we witnessed. The whole cast did a wonderful job and I couldn’t help but be thrilled for the younger cast members cutting their teeth on the stage and acting their hearts out. The orchestra down in the pit were also great in terms of giving everyone that familiar flavor of the Broadway stage. (to view the entire cast list, click here http://www.magicalstarlight.com/birdiecast.php). Being a backstage crew veteran of one season with Youth Theatre and a fond lover of set design, I was extremely impressed with the complexity and quality of sets which were utilized. It really makes a difference in community theatre. If you have been putting off experiencing a Magical Starlight Theatre production, I encourage you make plans. The community arts are truly a magical treasure for everyone involved and I look forward to many productions in the future. Best of all, I’m happy to report that I think my six year-old may have gotten the acting bug as result of this performance. As another Friday in Naperville begins to wind down, I once again find myself sitting here in awe over the amount of hits I received today regarding the topic of “dining in naperville”. I just arrived home after a quick weekend trip to New York City to assist my wife in throwing a surprise 30th birthday party for her sister. To any friends or family who may read this post, it was wonderful to see everyone. Tell us about your favorite Naperville restaurant. I’ve received thousands of hits to my “Naperville Restaurants” category and here is your chance to influence visitors and residents alike. You can write you own review by clicking on the “comment” button below. I will compile all responses into a future posting. If you would like to write your own full-fledged review and email it to me at worldofnaperville@yahoo.com I’d be more than pleased to dedicate an entire posting to your response as well. As the twinkling holiday lights slowly begin to fade, the recent blast of wintery weather over the weekend served as a bone-chilling reminder of the longest of seasons ahead. First, we will endure “Winter” and then on to what I call “Sprinter”… the season which is partially Spring, but mostly still Winter. I can’t help it, I grew up in Kentucky where the warmth of Spring begins thawing out the bluegrass, which isn’t actually blue, in late March. While I consider myself an optimist who is well-versed in making lemonade out of yellow snow…. or something like that… during the winter, the dark days of being cooped up inside the house with the children leave us parents scrambling for enjoyable activities which everyone can enjoy. In Naperville, there is one place which is #1 on my list when it comes to the Wintery plight and that is the DuPage Children’s Museum (DCM) over on Washington Street near the Downtown Naperville Metra Station. For those who are not familiar with DCM, just look for the colorfully artisitic block building with large windows facing Washington Street displaying an indoor water and bubble splashland. We are truly blessed to have this arts-infused creative family institution located in Naperville. My family and I have been annual members for a number of years and recently renewed for 2008. It’s a great bargain at around $88 when you consider the one day price for a family of four. If you aren’t ready to commit and decide somewhere between the music room and the wind tunnel that DCM is the place for your family, never fear… you can apply your paid one day admission toward an annual membership. Since DCM is a 501(c)(3) not-for-profit, the membership is also tax deductible. Larger donations in support of the museum are always welcome as well. I must confess that while our boys have a great time at DCM, it’s easy for the parents to get lost in play as well. There are three floors of interactive educational attractions for all ages. One of my personal favorites is the music room which is full of makeshift metal and wooden xylophones and drums. Ever wanted to jam with the Blue Man Group? there is a pvc pipe instrument complete with the soft flipper paddles similiar to the one played by Blue Man Group. Wind, water and bubbles are a big theme as well with plenty of experiments which can be conducted by the little scientists. Step onto the sudsy platform to see if you can pull a human-size bubble around you. Over-sized light brights, ball and track exhibits, a speedboat with a wind cannon, a dark room where you can freeze your shadow on the wall and activity rooms and tables are just a few of the other attractions. Special programs and events are scheduled regularly throughout the year. Under the talented leadership of Executive Director Sue Broad, there is a dedicated team of staff and volunteers to make each visit memorable. By the time you emerge from the fun, you will have almost forgotten those wintertime blues.